I realize not everyone has access to pheasant, in which case you can use any game bird or poultry in its place. It’s a pretty lean meat, so I sauté it in butter until the outside is cooked, but the inside is still pink. 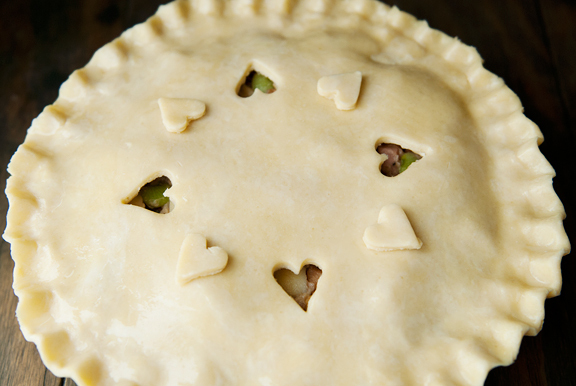 This helps to keep it tender when it finishes baking in the pie. 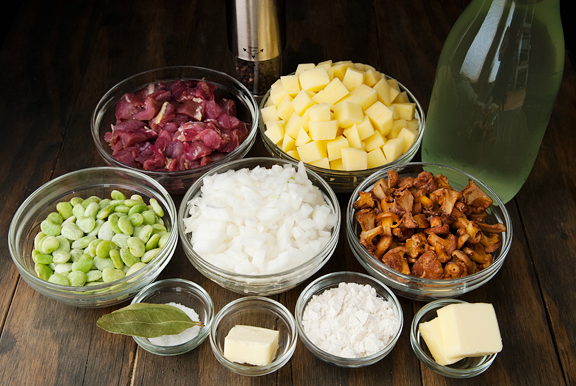 When all of the ingredients are ready, make the gravy. I don’t cook the frozen lima beans because they come already cooked. 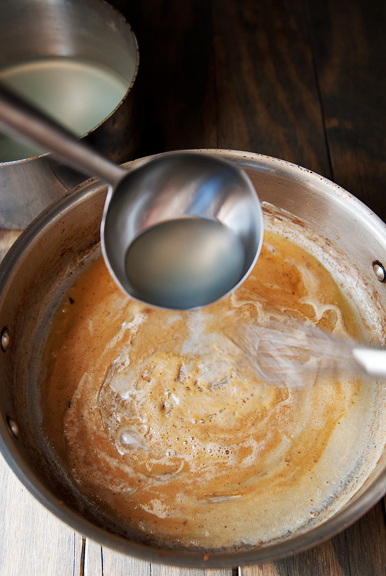 The reduced broth should be warmed before you add it to the roux. It just keeps the temperature from dropping as you make the gravy sauce. When it’s all done, mix everything together. 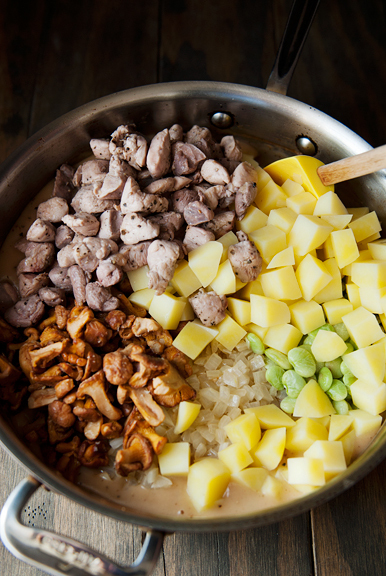 That’s your pot pie filling. I split up the process of making the pie over three days. This was day one. The filling will keep in the refrigerator for 3 or so days. It is also absolutely delicious to spoon straight into your mouth. On the second day, I made the pie dough. I have not had great experiences with pie dough until recently. A few readers had pointed me to Kenji’s pie crust dough recipe over at The Food Lab and I finally gave it a try. It works for me and I freaking love it. Thank you, readers. I love you guys. I reduced the amount of sugar in the pie dough for this savory pie, but some sugar is still good for browning in the crust. If you can only spend a little time here and there on a recipe, I get it. The dough takes about ten minutes tops to put together and then you can wrap it and pop it into the refrigerator for up to three days or the freezer for up to 3 months. Nice. Now on to assembly. I had about a cup of leftover filling which Jeremy took for lunch one day (he said it was delicious). 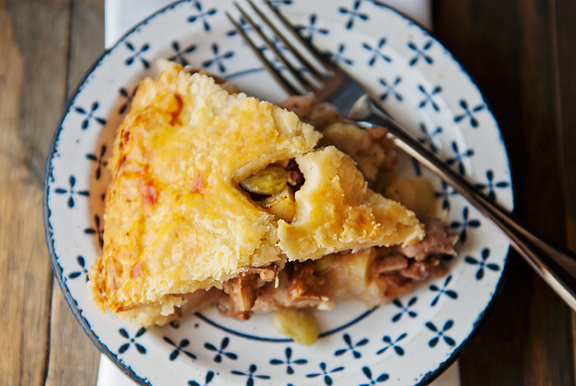 You could also make a smaller pie with the leftovers or try to stuff it all into the pie. I got a little nervous as my pie was quite full and I didn’t want to risk anything since I only had the one pheasant. On this pie, I made the mistake of putting foil around the edges at the beginning to prevent burning. I didn’t realize that the pie dough would stick to the foil and come off when I removed the foil. Sorry, I’m not an experienced pie baker. Except I kinda am, now. I’ve baked four pies in the last two weeks and I find it best to bake the pie for about 40 minutes and when the edges are just right, cover them with foil and let the center continue to brown. That works much better, you only need to take care not to burn yourself or crush the pie crust when you place the foil guard. I find it helps tremendously to pleat the top edge of each foil strip so it curves naturally. 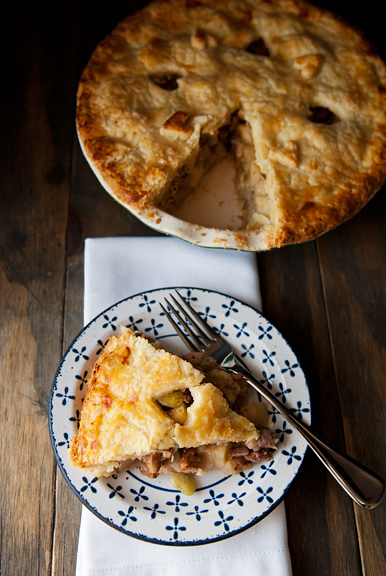 This pie is so damn good. I have rather mixed feelings about chicken – I think the flavor is pretty neutral, which might explain why I love game birds. 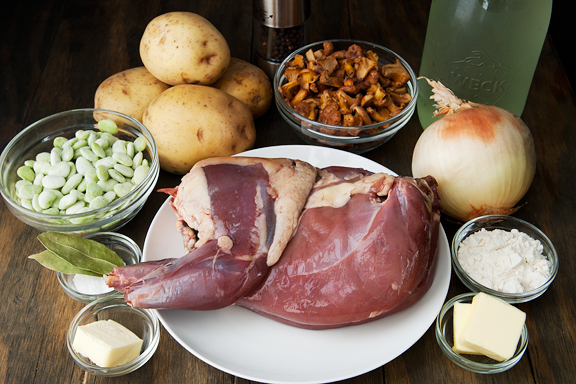 Pheasant is sweet and flavorful and delicious. I don’t find it gamey at all. 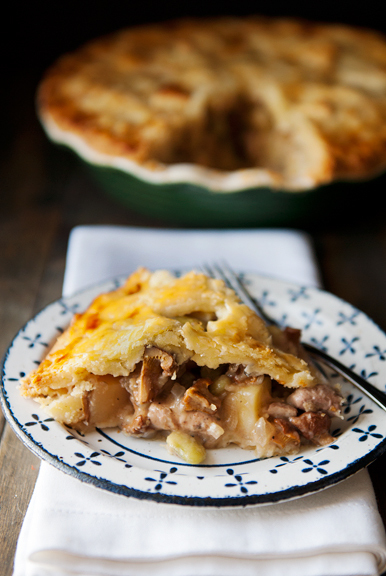 The pieces remained tender in the pie and complemented the chanterelles nicely. 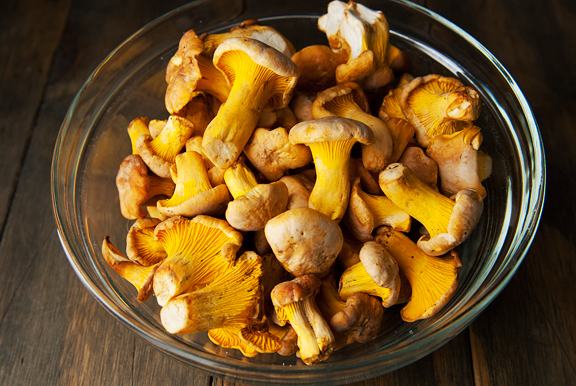 I like the idea of pairing wild foods that have similar seasons. I worried that the pheasant broth would be too weak in flavor, but once it was reduced, it held up well with all of the vegetables and mushrooms and pheasant. 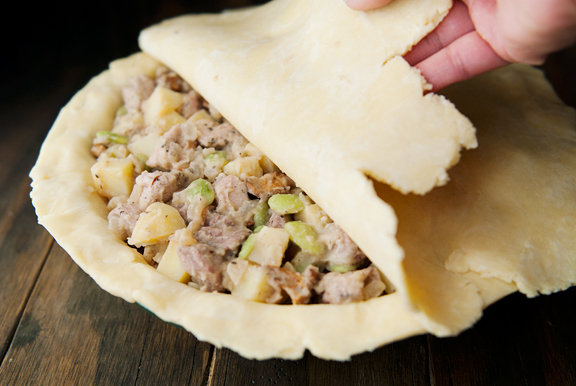 Wrap that in a flaky, buttery pie crust and you have yourself a winner. 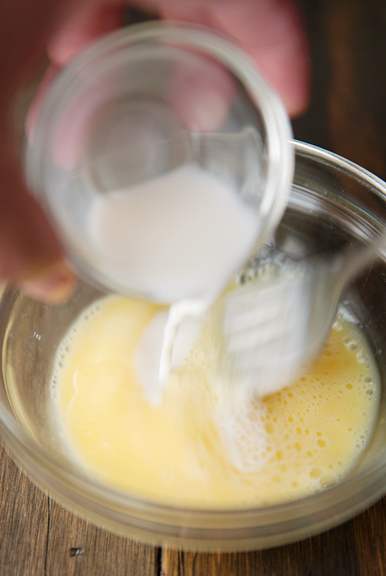 Place 1 1/2 cups of flour, the sugar, and salt into the bowl of a food processor. Pulse 5 times to combine. 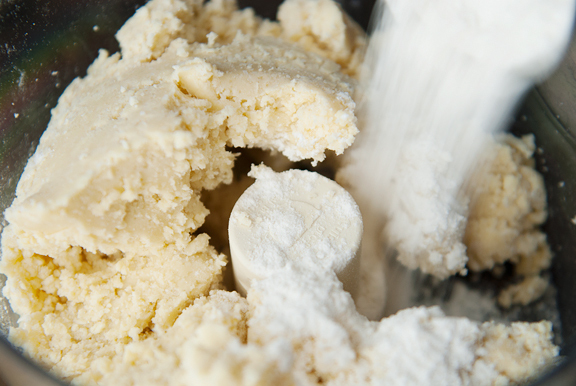 Distribute the butter over the flour mixture in the food processor. Pulse until the dough clumps (I pulsed about 25 times and then ran it 15 seconds at a time until it clumped). 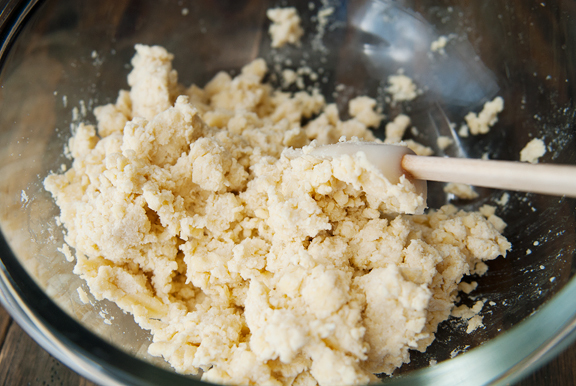 Sprinkle the rest of the flour over the dough and cut it into the dough by pulsing about 5-10 times until the dough has broken into small chunks. Empty the dough into a large bowl and sprinkle the cold water over the dough. 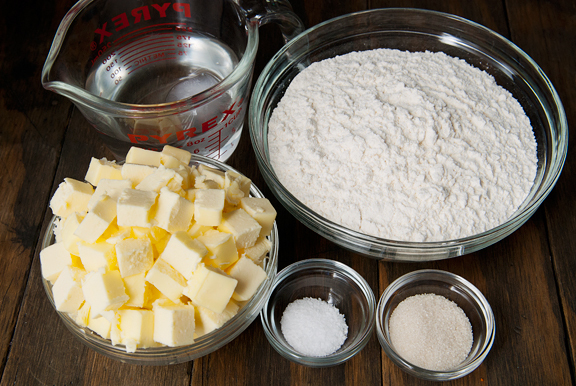 Fold the water into the dough with a soft spatula (don’t use your hands, the heat will melt the butter). All of the loose crumbs will come together into a ball. Cut the dough into two halves and shape them into 4-inch diameter discs. Wrap each disc in plastic wrap and refrigerate for at least two hours or up to three days. If not using within three days, freeze the dough for up to 3 months. *I made pheasant stock from another pheasant carcass I had in the freezer. I basically covered it with water in a pressure cooker and set it on high for 15 minutes then natural release. 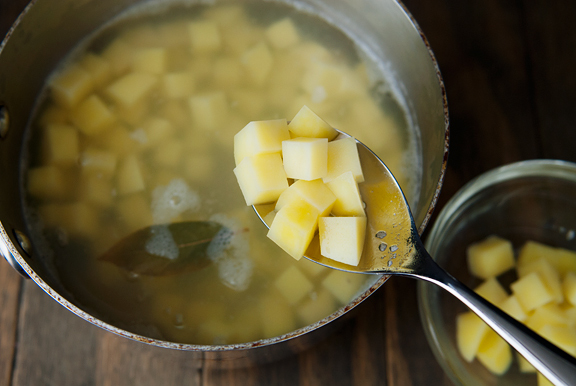 Cook the potatoes and reduce the broth: Bring the broth and the bay leaves to a boil in a medium saucepan. Reduce the heat to medium or medium low heat and add the potatoes. Cook the potatoes until tender (about 10 minutes). 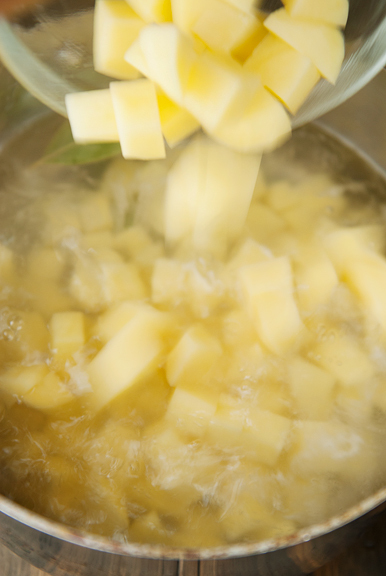 Remove the potatoes with a slotted spoon to a large bowl. Simmer the broth until it has reduced to about 2 cups. Discard the bay leaves and set the broth aside. 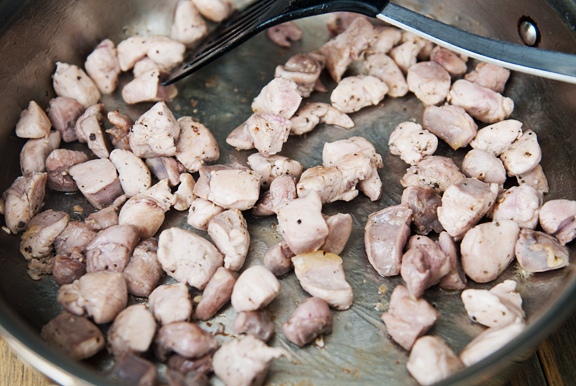 Sauté the mushrooms, pheasant, and onions: Melt a tablespoon of butter in a sauté pan over medium high heat. 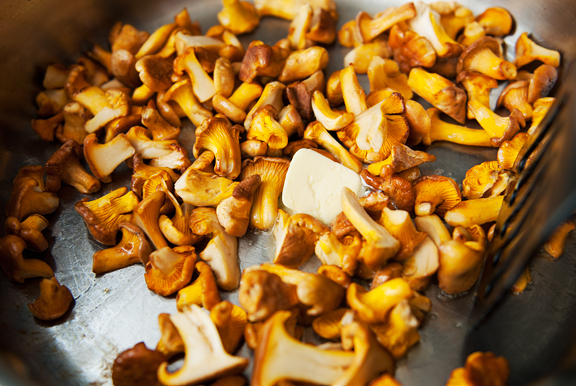 Add the chanterelles to the pan when the butter begins to bubble. 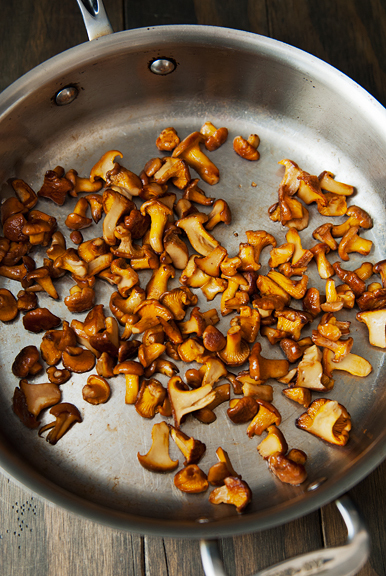 Sauté until the mushrooms wilt. 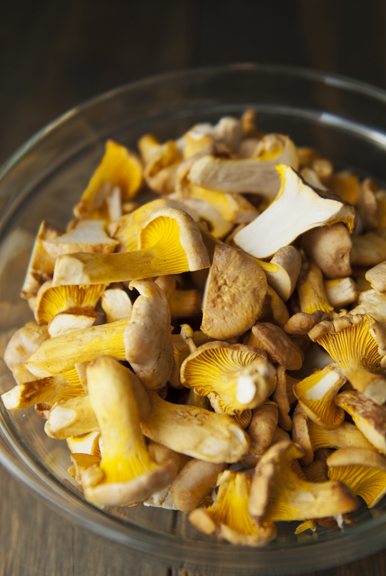 Sprinkle a pinch of salt over the mushrooms. When they are cooked, remove them from the pan to the bowl with the potatoes. Season the pheasant with salt and pepper (about 1/2 tsp each) and mix to distribute. 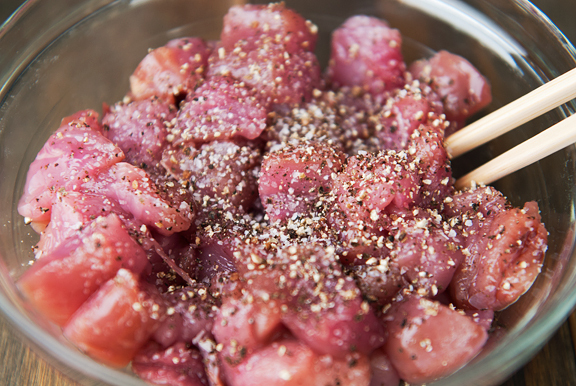 Using the same sauté pan, melt a tablespoon of butter in the pan over medium high heat. When the butter begins to sizzle, add the pheasant and sauté until the outsides are cooked (leave it pink in the center). Remove from heat and add the pheasant to the large bowl. Using the same sauté pan, heat the vegetable oil over medium high heat. 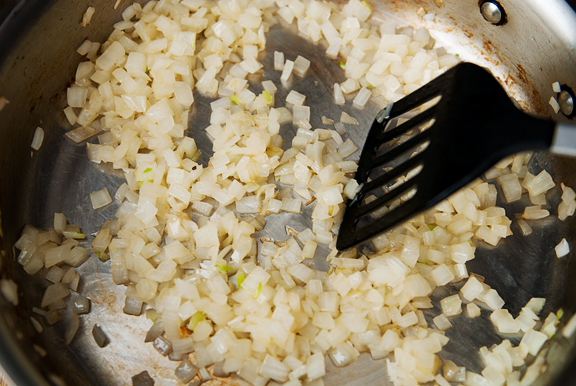 When the oil is hot, sauté the onions until translucent. Add the onions to the large bowl. 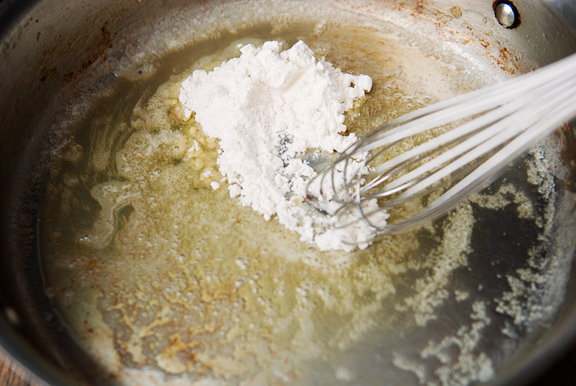 Make the roux and combine the filling: If the broth has cooled, reheat it while you prepare the roux. 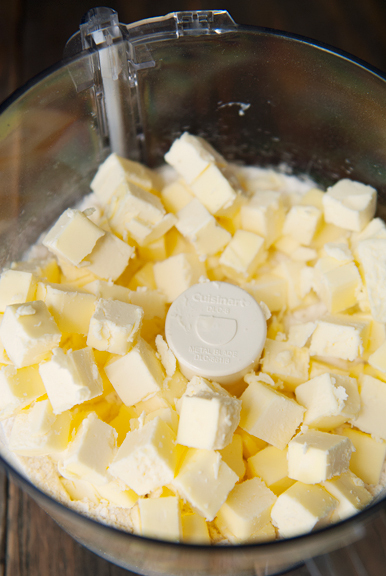 Using the same sauté pan, melt the remaining 3 tablespoons of butter over medium high heat. 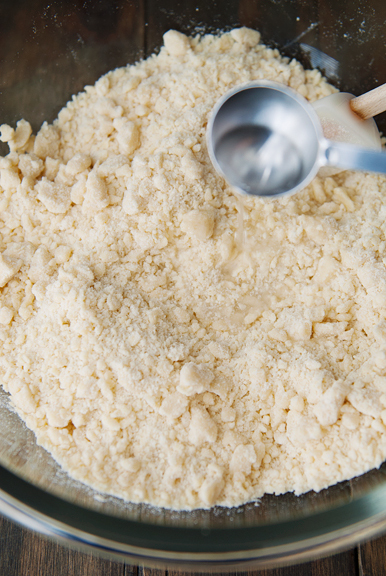 Stir the flour into the butter and keep stirring until the roux turns brown. Ladle a little bit of the hot broth into the roux at a time while whisking to incorporate it. 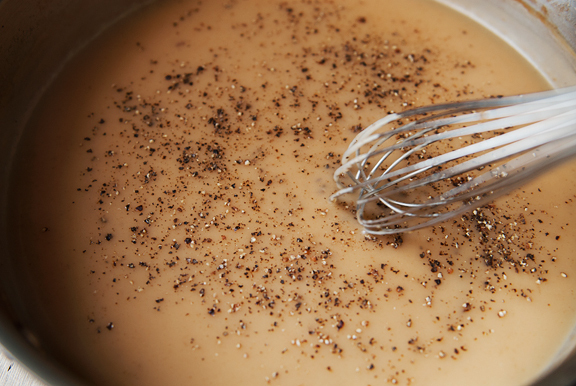 Keep adding more broth while whisking until you get a thickened gravy (about 10 minutes). Season with salt and pepper. 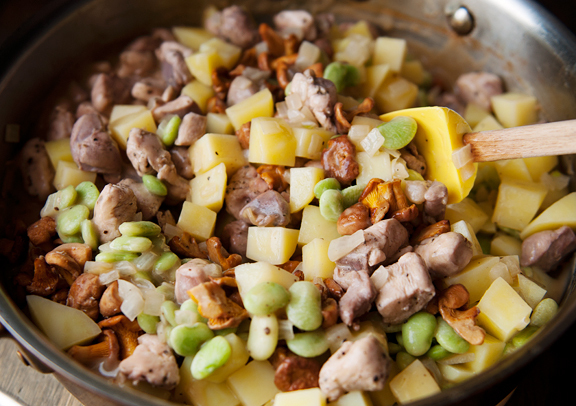 Add the potatoes, mushrooms, pheasant, onions, and lima beans into the gravy and stir to combine. At this point you can let the filling cool and refrigerate it for up to 3 days before using. 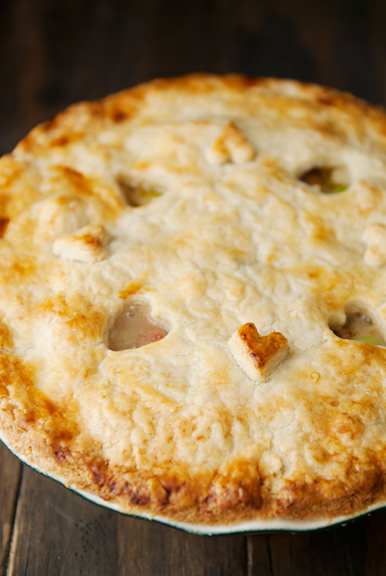 Assemble and bake the pie: Preheat oven to 375°F with rack in the center of the oven. 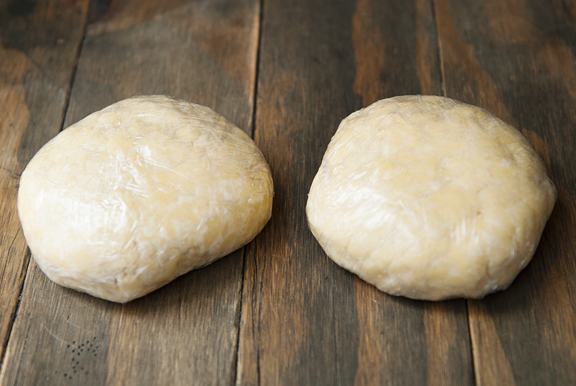 Roll the two dough discs out to 1/4-inch thickness. Line a 9-inch pie dish with the larger of the two pie crusts, pressing the dough into the corners. 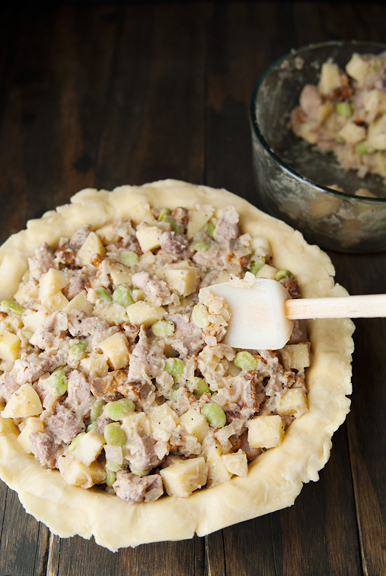 Pour the filling into the pie dish (you may have leftover filling – that’s okay, it’s great to eat on its own). 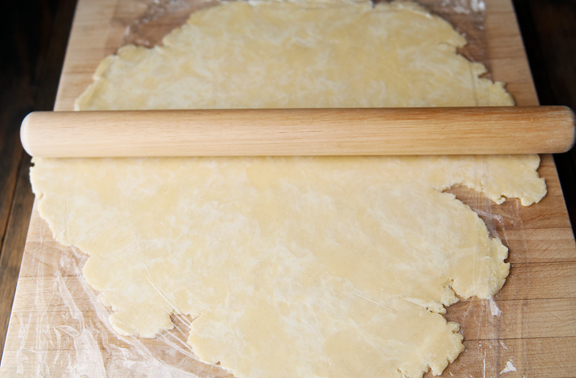 Cover the pie with the other pie crust dough and seal, trim, and crimp the edges together. 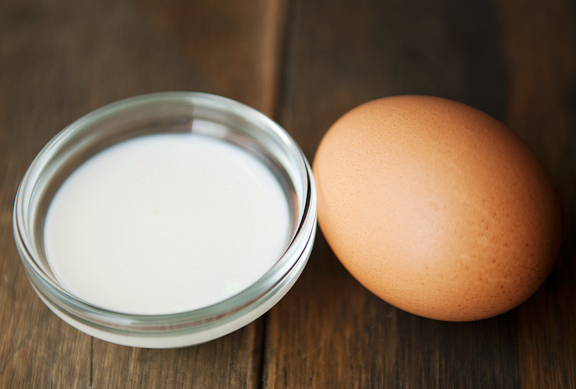 Whisk the egg and cream together. 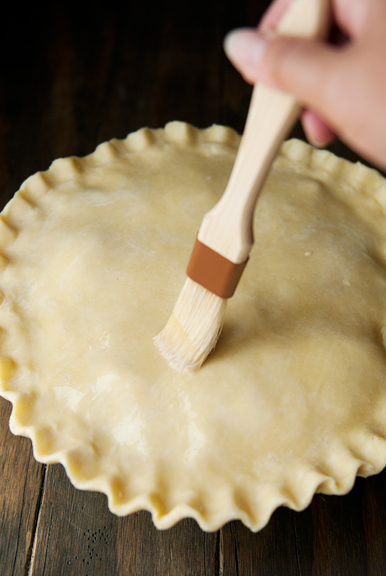 Brush egg wash over the pie crust and cut steam vents in the top to allow steam to escape during baking. Bake for an hour. 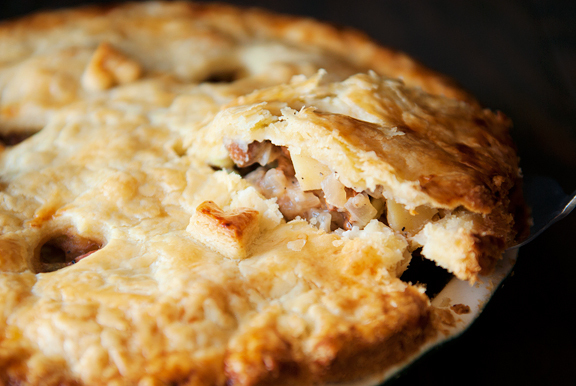 If the edges of the pie crust brown faster than the center, you can cover the edges with foil after about 40 minutes. I tried doing it before the pie went into the oven, but the dough winds up sticking to the foil – so covering it after it has browned works better, you just have to be careful about not burning yourself. Remove the pie from the oven and let it rest for 15 minutes before serving. Serves 6-8.
learning everything, too. 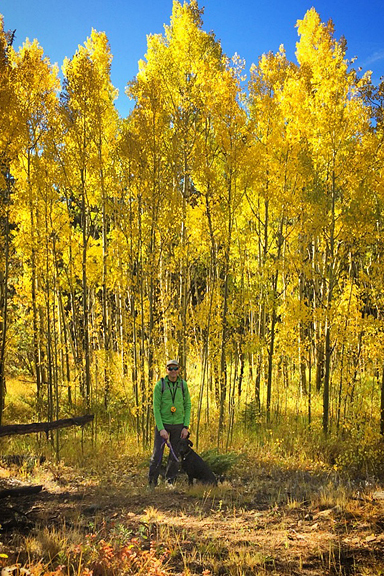 On your way to a calmer canine companion! 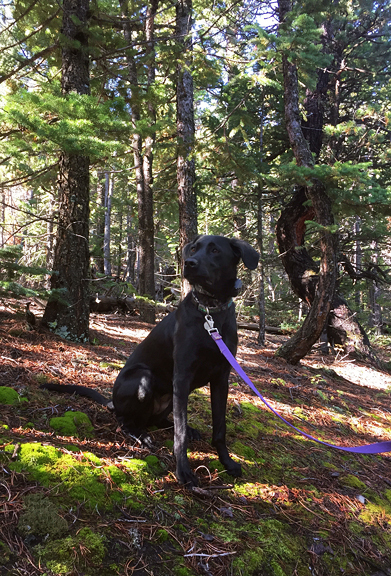 It is good that you keep her on a leash in the woods. 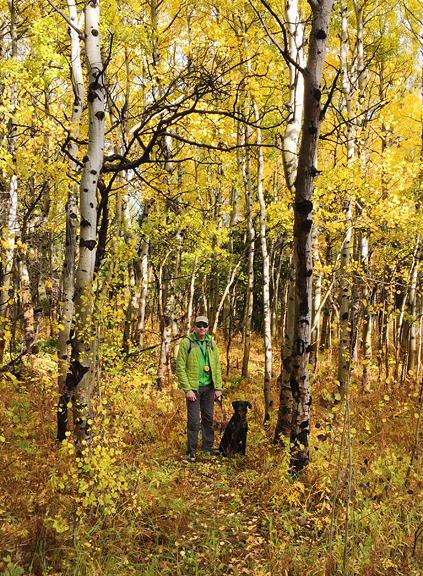 Here it is illegal to have a dog off leash in a national or provincial park. One reason is you don’t want your dog charging into the woods and being chased out by a bear, the dog leading the bear right to you! Aww Neva. :\ I’m glad you (and she) were able to give it another try though. Good girl. Wow this looks delicious! 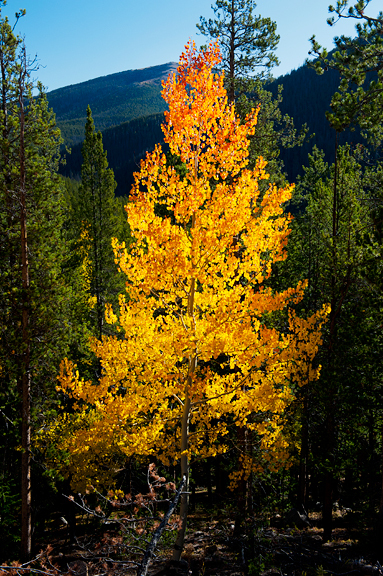 And your fall photos make me want to take a trip to Colorado. I love reading your blog regularly but have never posted before. However after reading your latest training session with Neva I had to share because I can totally relate. I have two dogs and one is a big-time puller who absolutely must sniff/chase/investigate everything! We tried everything to teach him loose leash walking including clicker training, group classes, personal training in our home, etc. After a year or two, we finally just gave up honestly and dealt with the pulling hoping he’d eventually grow out of it. Then one day when he was about 3, and we were at the pet store packing up on treats and supplies for a week vacation (with the dogs of course), we decided to buy one of those no-pull harnesses (the kind that goes around the chest not the nose) on a whim in hopes we could have a more relaxing vacation given all the hikes we had planned. It has been a complete and total game-changer. I would say pulling was immediately reduced by 75%. And as far as I can tell, it doesn’t hurt him any more than a typical collar does when he does pull. Anyway just wanted to share in case you haven’t tried it before, its the only thing that made walks more enjoyable for us and I still can’t believe we didn’t try it sooner. Love your blog – thanks for sharing so many delicious recipes! I can only imagine your fear when you couldn’t find your Neva girl. Sounds like training has been a huge success with her! I’m sorry about your experience with the collar. I LOVE PHEASANT!!! I don’t have a dog so hunting is out :-( I so miss this wonderful tasting bird. Where did you get your pheasant? 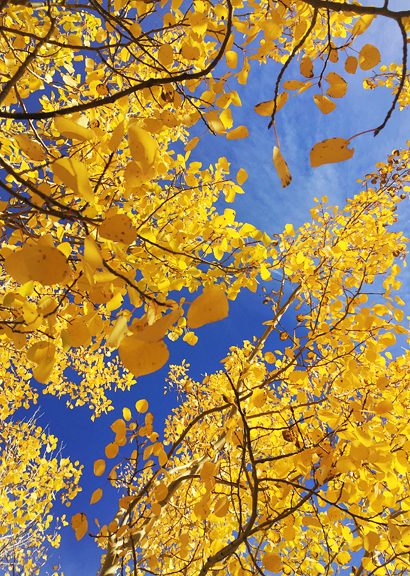 Sarah – Thanks for sharing your experience! We have so much hardware for Neva we could almost open a store. We use a combination of the harness and the halti collar with Neva. She pulls less but still pulls A LOT. The halti (gentle leader) seemed to be the most effective without the use of the e-collar, but she hates it and tries to rub it off on your legs at every opportunity. The harness doesn’t bother her, but she also pulls more with just the harness on, which leads to rubbing her hair off and leaving a few scabs on her chest. I hate that. With the e-collar, we can walk her on her regular old flat collar and she’s 1) well-behaved and 2) happy! :) I think it’s a matter of finding what works best for your pup. Each dog is different. I’m glad you found a solution! Shari - Ha ha! I have a dog and I still don't hunt pheasant ;) My pheasant came from neighbors who hunt. But I think there are places online where you can order frozen pheasant! That’s awesome about the grouse – I wish you many happy returns. I’ve actually been offered the opportunity to go pheasant hunting, but honestly both Steve and I don’t have much interest in the process of bird hunting. Seems odd considering. But for now we will stick to bowhunting (and sometimes rifle hunting) deer and pig. I am just thankful my pheasant-hunting coworker loves to share!